Once you add layers and columns to your project, you can modify their names. In the Timeline view, double-click on the name of the layer to rename. In the Name field, rename the layer and press Enter/Return. In the Timeline view, double-click anywhere on the layer except the layer name to rename. The Layer Properties editor opens. In the Name field, rename the layer. In the Xsheet view, double-click on a column name. Do not click on the drawing folder name that the column is linked to (this also appears in the column header just below the column name). 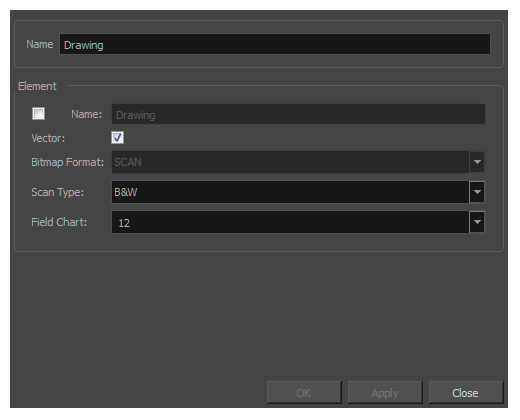 The Drawing dialog box opens. In the Name field, rename the column.